In the cool Anaheim pre-dawn morning, we all lined up in our assigned corrals in anticipation of the 6am start time. With Mickey, Minnie and Donald counting down, we began running, with 5 minute intervals between each corral. At 6:10, I began my run and headed down the road and away from Downtown Disney. From there, the route took us around and through Disneyland followed by California Adventure. After leaving California Adventure, we ran the streets of Anaheim, where onlookers stood amongst the closed off streets. It seemed strange as we left the Disney property and headed across town, where we passed Honda Stadium (home of the Ducks) and to Angels Stadium, where we ran on the warning track before turning back towards Disney. Another cross town run lead us back to the front of the Disneyland Resort, where we completed our 13.1 mile trek around Anaheim. Running the Disneyland Half Marathon had a very different feel than the Disney World one. Since Disney owns so much more property in Florida, they are able to own all roads we run on and can do more production throughout the course. In California, we were running on local roads, where we were greeted by more local entertainment that was not Disney associated. Instead of pirates and princesses, there were marching bands, cheerleaders and Hawaiian dancers. My third half marathon was an exhilarating experience that I am proud to have completed in 2 hours 13 minutes and 22 seconds, bringing me to the edge of being able to run a half marathon with an average pace time of 10 minutes per mile. 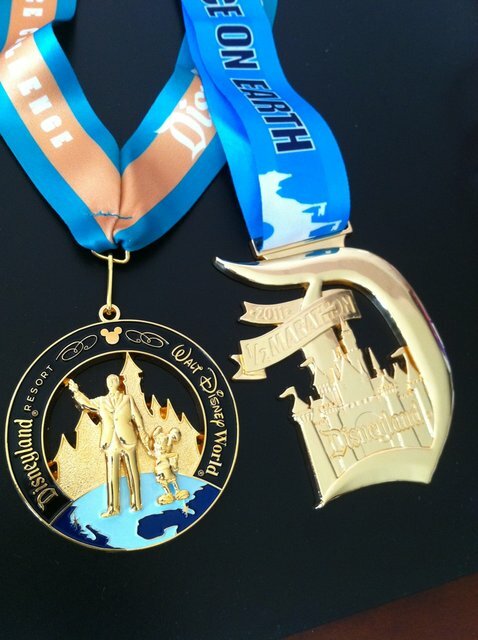 Hopefully I can achieve that goal with my next half marathon and I look forward to running Disney again next year.